I’m not entirely sure what’s happening here. Zoom 909 isn’t just about blowing up spaceships. It’s about how cool you can look while blowing up spaceships. See, instead of destroying ships from the standard two-dimensional vertical/horizontal perspective, the camera is positioned in a third-person perspective behind your ship. That means enemies will sail towards you and it will appear as if they’re three-dimensional and they’ll leap off the screen and blast your face in! In reality, the enemies are 2D sprites “scaled in real time to give an illusion of depth” (Source). I’m quoting that because I’m not entirely sure what it means, but I know it’s true, and knowing is half the battle. Each round in Zoom 909 is comprised of four parts: the bordered trench portion, the wide open plain portion, the-portion-that’s-basically-Asteroids-but-a-lot-harder portion, and a final boss. In the bordered trench section, you’re surrounded by green walls and floors that scroll by at seemingly tremendous speeds, while multi-colored enemy spaceships race towards you. Shoot the ships, don’t crash into the walls. I sense the zoom, but I’m not too sure about the 909 part. You have a fuel meter that drains consistently, but the game does give you a goodly amount of fuel bubbles (this isn’t Safari Race, thank God). Fuel is your life/lives. There is no traditional two or three-life system. If you crash or get crashed into, a chunk of your fuel will be taken away. Lose all of your fuel and the game is over. Eventually, after you’ve passed a number of in-your-face green walls in the bordered trench section, you’ll be blasted into the vista. The same shooting shenanigans take place here, just on a wider surface area. Fight the enemy ships or stay out of their way, and after thirty seconds or so, you’ll be taken to the almost-Asteroids section. This area is intense and wrong and too much for me. Your perspective changes from not-quite-3D to absolutely top-down 2-D, and your ship hovers quickly over a large grid without your consent. Asteroids and enemy ships and fuel bubbles and power-ups are littered about on the grid, as well. The goal seems to be to collect power-ups which give you invincibility so you can sail around the grid, unabated, until the game decides it’s time to move on to the boss. But I never got that far. Trying to fly in this area is hopeless. Better to float hopelessly on the grid and shoot your best, then flail about and watch your fuel drain. Perhaps I just need to work on my zoom-zoom skills or perhaps the Asteroids portion is just a bit too difficult. Either way, I never saw the boss. Zoom 909 is the SG-1000’s answer to Starfox sans puppets. 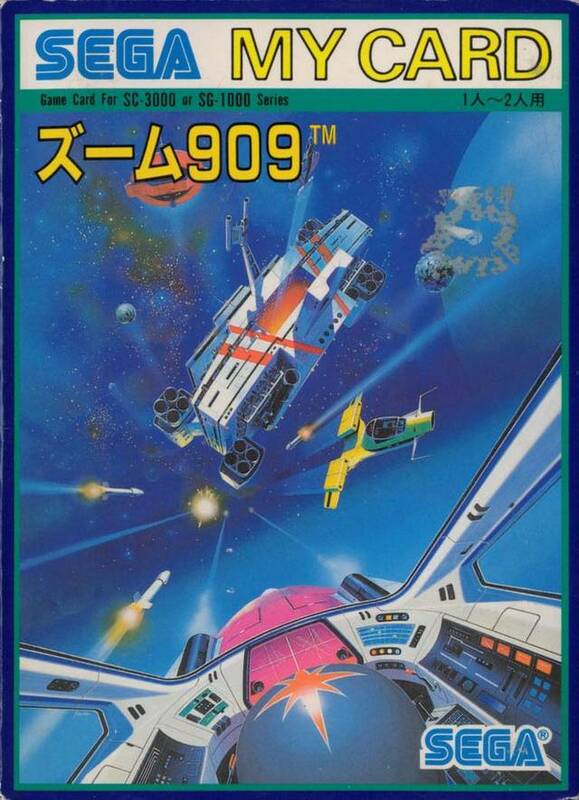 Zoom 909 got re-worked into Buck Rogers: Planet of Zoom for Western audiences because a sci-fi license sells a game more than a generic title. The SegaRetro clan claims that both Zoom 909 and Buck Rogers are essentially the same, save for some “minor graphical differences.” I couldn’t test that claim, as I couldn’t find a working Zoom 909 “machine.” I did find one of Buck Rogers, though, and compared to the SG-1000 port of Zoom 909, the former is quite different. Instead of a fuel gauge, you have a time gauge. If the time gauge runs out, it speeds you to the next portion of the level instead of killing you. Buck Rogers also wants you to destroy a certain amount of UFOs in each section in order for a bonus, but it’s not essential to completing the game. The different portions of each level flow more easily into each other, and you have a standard amount of three lives. In truth, Buck Rogers plays more like an upgraded Zoom 909 with fancier effects and a stronger sense of direction. I enjoyed enveloping myself in Zoom 909‘s fancy scrolling effects and pseudo 3-D trickery. Blasting enemy ships out into the psychedelic nethers of space is always a good time, as well. 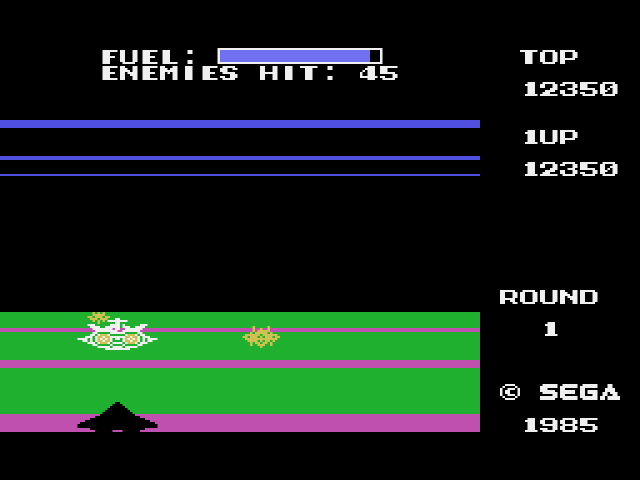 Still, despite the visual magic and bang-bang-boom, I’m not sure what the game wanted to achieve. As soon as I was settling into a particular area, the game would fling me to a new dimension for no discernible reason. This wasn’t bad, per say, just vexing. I never knew if I was destroying the appropriate amount of on-screen crap or if I was collecting the proper amount of points. The only goal seemed to be to collect as much fuel as possible in order to keep your ship gassed up and not crashing onto an alien surface. Admirable, sure, but not exactly a driving force to want to complete the game. If that’s my only complaint (well, lack of purpose and that damned Asteroids portion), I guess I should be thankful. Zoom 909 certainly challenged my perception of the SG-1000’s processing power. 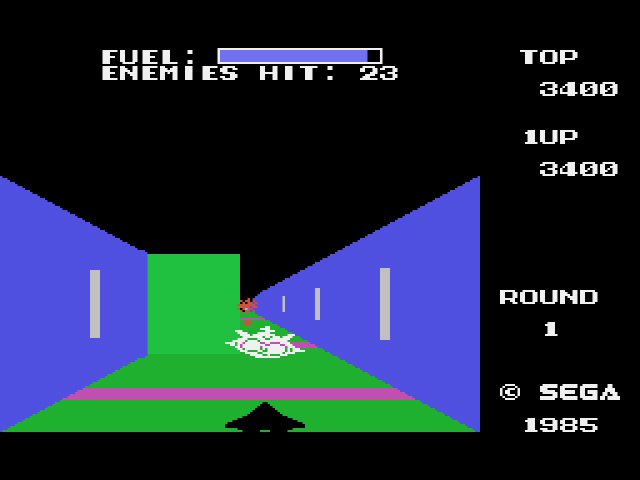 The graphics were impressive, the music was as good as any NES action title made by Konami or Capcom (no, really). For as long as I played the game – as long as I could stay alive – I enjoyed myself. Still, I doubt even Buck Rogers’ corpse* could drag me back to Zoom 909‘s bleak identity-free world of three-dimensional sorcery. This blog (and the podcast) have become my addiction. When I don’t get an update I get itchy. Thanks for being my dealer! The write-ups (and casts of pod) are always worth whatever wait there is. Thanks kurdt! I’ll be on vacation for the next few days so updates will be sporadic, but I appreciate the compliments! 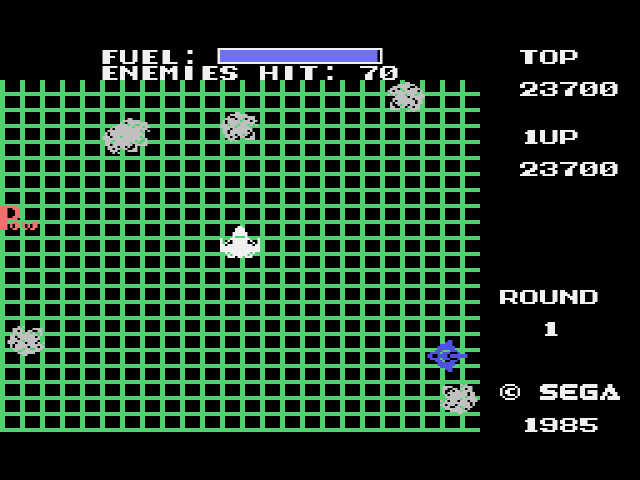 Even though the graphics are bland (because this is the SG-1000), the pseudo-3D effect is awesome. It’s really cool to see this console was capable of that kind of stuff. This was one of the few non-typing-in-the-program-from-a-magazine/book games my dad had for his Coleco Adam when I was but a sprout and I played the beejeezus out of it. As a kid, I thought the flying saucers looked like fried eggs so the purple ones always grossed me out. This version doesn’t seem to keep that detail, so I’mma haveta give this port -100 points. A few years back, I played all of the games on MAME, starting with the earliest, and I have to say, the arcade game looked amazing for 1982. They honestly could have ported it to the Genesis without upgrading the graphics, and it would have looked fine. I think it was a real turning point for SEGA.